Looking over the few posts I have here and all of the talking I have been doing at work... I seem to be a Samsung DeX evangelist. I think its great... I like the enhancements Samsung has done by adding it to the Note 9 device. I also see many 3rd party manufacturers starting to make products that are DeX compatible. One item coming to the market soon will be the Vinpok Split! Coming soon to Indiegogo. 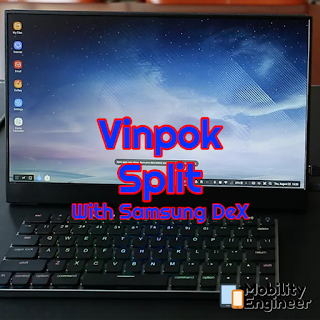 the Vinpok Split, a $200 dollar monitor that is compatible with DeX, Nintendo Switch, and has a micro HDMI input. I am waiting for the Indiegogo to become active next week for the full specs. Hopefully, they can stick to the 200 dollar price point. At this time, I believe it is a 15-inch screen. I like this because not only does it boot into DeX, it also acts like a second screen, great for two screen - digital media creators like myself. Before DeX, I have always looked for a solution to carry a second screen as I travel for editing... because I'm spoiled and like certain things off my main screen.